The cloud offers organizations a number of benefits, from simple off-site storage to rent-a-server to complete services. But 2017 will also see cloud infrastructure increasingly the target of attacks, with criminals lured by the data stored there and the possibility of using it to launch distributed denial of service attacks. That’s one of the predictions for the new year from security vendor Forcepoint. Hacking a cloud provider’s hypervisor would give an attacker access to all of the customers using the service, Bob Hansmann, Forcepoint’s director of security technologies, told a Webinar last week. “They’re not targeting you, they may not even know you exist until they get into the infrastructure and get the data. Then they’re going to try to maximize the attack” by selling whatever data is gained. Also tempting attackers is the bandwidth cloud providers have, to possibly be leveraged for DDoS attacks. As attacks on cloud infrastructure increase it will be another reason why CISOs will be reluctant to put sensitive data in the cloud, he said, or to limit cloud use to processing but not storing sensitive data. So answering questions such as now long does a cloud service hold the organization’s data, is it backed up securely, are employees vetted, is there third party certification of its use of encryption, how is it protected from DDoS attacks are more important than ever. –Don’t fear millennials. At present on average they are they second largest group (behind boomers) in most organizations. They do increase security risk because as a tech-savvy group they tend to over-share information – particularly through social media. So, Hansmann says, CISOs should use that to their advantage. –the so-called Digital Battlefield is the world. That means attackers can be nation-states as well as criminals. But CISOs should be careful what they do about it. Some infosec pros – and some politicians – advocate organizations and countries should be ready to launch attacks against a foe instead of being defensive. But, Forcepoint warns, pointing the finger is still difficult, with several hops between the victim and attacker. “The potential for mis-attribution and involving innocents is going to grow,” Hansmann said. –Linked to this this the threat that will be posed in 2017 by automated attacks. The widespread weaponization of autonomous hacking machines by threat actors will emerge next year, Forcepoint says, creating an arms race to build autonomous patching. “Like nuclear weapons technology proliferation, weaponized autonomous hacking machines may greatly impact global stability by either preventing national defense protocols being engaged or by triggering them unnecessarily,” says the company. 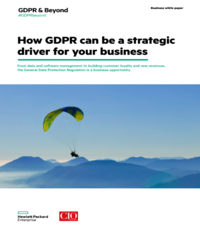 –Get ready for the Euopean GDPR. It will come into effect in May, 2018 and therefore next year will drive compliance and data protection efforts. “We’ve learned compliance takes a long time to do right, and to do it without disrupting your business.” Organizations may have to not only change systems but redefine processes, including training employees. CIOs need to tell business units, ‘We’re here to support you, but if you’re going to run operations through the EU this regulation is going to have impact. We need to understand it now because will require budgeting and changes to processes that IT doesn’t control,’ said Hansmann. The result is staff falsifying reports or signing up customers signed up for services they didn’t order. Think of U.S. bank Wells Fargo being fined $185 million this year because more than 2 million bank accounts or credit cards were opened or applied for without customers’ knowledge or permission between May 2011 and July 2015. Over 5,000 staff were fired over the incidents. If organizations don’t get on top of this problem governments will regulate, Hansmann warned.